Despite the recent heat wave, Fall has arrived. Besides the presumably cooler weather, when the calendar hits September, we can always look forward to a number of things – school starts, rush hour traffic resumes, shorter days, etc. 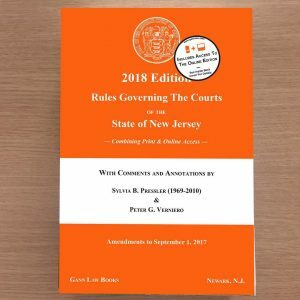 However, for us lawyers September brings with it the annual amendments that have been approved by our Supreme Court to the Rules Governing the Courts of the State of New Jersey. Unlike last year, a number of these recent Rule Amendments directly impact upon Family Part Practice. A number were in response to statutory changes that recently went into effect. In light of the number involved, I will summarize and discuss these Amendments over the course of several blog posts. First, there have been a number of significant changes to Rule 5:3-5, the rule dealing with attorney’s fees, retainer agreements and withdrawal of counsel in Family Actions. Under Rule 4:42-9, an allowance for the awarding of attorneys fees in Family Actions is expressly authorized. Rule 5:3-5 set forth the procedural and substantive prerequisites and requirements for such fee applications, not only referring to the factors enumerated in the Rules of Professional Conduct (RPC 1.5(a)), but the provisions of Rule 4:42-9(b), (c), and (d). Rule 4:42-9 (b) requires that all applications for the allowance of fees be supported by an affidavit of services addressing the factors in the RPC 1.5. Notwithstanding the fact that reference to this Rule was included already, the Supreme Court felt it prudent to repeat the language of Rule 4:42-9 (b) almost verbatim as new subsection Rule 5:3-5(d), and thereby avoid any doubt that all such applications for the allowance of fees be supported by an affidavit of services. As a result, former subsection (d) became subsection(e), dealing with withdrawal from representation. In actuality, the most significant amendment to Rule\5:3-5 was the addition of subparagraph (e)(3) dealing with the handling of motions to withdraw from a procedural or scheduling basis. Often a breakdown in the attorney/client relationship occurs during the midst of the divorce litigation. Sometimes this occurs when there are other disputed issues that are being brought before the court by way of motion. The problem which often arose was how these substantive disputes would or could be addressed where a breakdown in one party’s attorney/client relationship had also lead to an application to withdraw or to be relieved being filed. The new Rule 5:3-5(e)(3) attempts to address this predicament. This Rule provides that upon the filing of a motion or cross motion to be relieved as counsel, the court, absent good cause, shall sever all other relief sought by the motion or cross motion from the motion to be relieved as counsel, and whereby the court would first decide the motion to be relieved and, in the order either granting or denying the motion to be relieved include a scheduling order for the filing of responsive pleadings and the return date for all other relief sought in the motion or cross motion. This is obviously designed to avoid situations where the party and/or counsel are forced to address substantive matters when there has been a apparent breakdown of relationship and/or conflict between a party and his or her attorney at that juncture. Rule 5:3-7 was amended to add the term “financial maintenance” to those types of orders upon which a court may grant relief and impose remedies upon a finding of a violation thereof. Why was this deemed necessary? In February 2017, the provisions of the newly enacted statute, N.J.S.A.2A:17-56.67e went into effect. Commonly referred to as the “emancipation” statute, its focus was the modification of current law relating to the duration and termination of child support obligations. Under this law, the obligation to pay child support would terminate by “operation of law” and without order by the court on a date that a child marries, dies, enters the military service or reaches 19 years of age, unless (1) another age for the termination of child support is specified in a court order, but in no event beyond the date the child reaches 23 years of age, or (2) upon written request seeking the continuation of child support beyond the age of 19 for a child (a) who was still enrolled in high school or other secondary educational program, (b) was a student in a post-secondary educational program enrolled for what the school considers to be full-time attendance during part of at least five (5) calendar months of the year, or (c) has a physical or mental disability as determined by the federal or state governmental agency existing prior to the child reaching age 19 and requiring continued child support. Absent this, a parent could only seek to extend child support beyond the age of 19 by motion “due to exceptional circumstances as may be approved by the court”. However, the statute also provides that it was not intended to prevent a child who is beyond 23 years of age from seeking a court order requiring the payment of other forms of financial maintenance or reimbursement from the parent as authorized by law to the extent same was not payable or enforceable “child support” as defined in N.J.S.A. 2A:17-56.52, or prevent the court upon application due to exceptional circumstances, including but not limited to a mental or physical disability, from converting a child support obligation to another form of financial maintenance for a child who had reached the age of 23. Hence, given the statute’s reference to and/or creation of this new type of “financial maintenance,” the enforcement provisions of Rule 5:3-7 were amended to include these types of orders. It should be noted that the procedural and/or implementation aspects of N.J.S.A. 2A:17-56.67e were addressed at length in a new rule, Rule 5:6-9 which will be discussed in more detail in my next blog post. Rule 5:4-2 dealing with Family Part Complaints was amended in two respects. First, Rule 5:4.2(a)(2) was amended so as to provide that if a civil union or domestic partnership existed between the parties, it was to be stated in the complaint, and that if a dissolution or termination of that relationship is sought, that the complaint contain a separate cause of action seeking such relief. Rule 5:4-2(f) dealing with the requirement to file an affidavit or certification of insurance coverage with the initial pleading of each party, clarified that in addition to same listing life, health, automobile, and homeowners insurance that it also include renter’s insurance and any umbrella policy related thereto, long – term care, and disability insurance as well. Attorneys should amend their forms to include reference to these types of insurance coverages. Rule 5:4-5 is a new rule which has been adopted by the Supreme Court. Specifically, this Rule provides that a plaintiff must cause a summons to issue within 60 days after the filing of a dissolution complaint, and that should plaintiff fail to do so, that a defendant may seek dismissal of the complaint or such other relief as is just and equitable, which dismissal would be without prejudice unless otherwise specified in the order. The purpose for this Rule was to avoid plaintiff’s being able to strategically or deliberately not serving a dissolution complaint within a reasonable time after its filing and specifying the consequences which may result in failing to do so. For example, to establish a marriage end date for equitable distribution purposes. Indeed, this Rule largely adopts a process most counties were already following, issuing notices for dismissal for want of prosecution if proof of service for a complaint was not filed within a given period of time. I will address another set of Family Part Rule Amendments in my next blog post. Stay tuned.